With the 200th birthday of Charles Dickens quickly approaching, and an entire series of events planned, what is the lasting legacy of his work and his causes? Charles Dickens is one of the most important writers of the 19th Century. But his influence goes far beyond just literature. Many of his phrases, characters and ideas have engrained themselves in modern culture. Two centuries on, what are the things still seen today that Dickens first offered us in his writing? Modern commentators have described Dickens as "the man who invented Christmas". Not obviously the religious festival, but the wider popular culture phenomenon that surrounds it. In the early 19th Century, Christmas had become "scarcely worth a mention", according to critic and writer Leigh Hunt. As an example, the committee of the Carlton Club, which ran the Conservative Party at the time, arranged ordinary business meetings on Christmas Day itself. While Prince Albert is often credited with the revival of Christmas and the introduction of the Christmas tree, many believe that Dickens's popular depictions of the festive period became a blueprint for generations to come. Specifically, the idea of a white Christmas - which was and still remains a relatively uncommon occurrence in much of the UK - appears in A Christmas Carol as if it happened each and every year. In his biography of Dickens, Peter Ackroyd wrote: "In view of the fact that Dickens can be said to have almost singlehandedly created the modern idea of Christmas, it is interesting to note that in fact during the first eight years of his life there was a white Christmas every year; so sometimes reality does actually exist before the idealised image." Writer and renowned Dickens expert GK Chesterton perhaps best summed up how the great author's romantic view of Christmas has permeated throughout the world. "Whether the Christmas visions would or would not convert Scrooge, they convert us," he wrote. One of the things Dickens cared about most was those at the bottom. He was one of the first to offer an unflinching look at the underclass and the poverty stricken in Victorian London. And this was an area in which he had some experience. His father had little skill in financial management and this eventually put him and all of his family in a debtors' prison for six months. 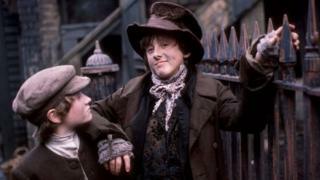 The young Dickens worked in a cousin's shop, pasting labels on blacking bottles for six shillings a week. After he became famous, Dickens helped popularise the term "red tape" to describe the bureaucracy in positions of power that particularly hurt the weak and poor. "Dickensian" has now become the easiest word to describe an unacceptable level of poverty. In 2009, when president of the Association of Teachers and Lecturers wanted to talk about the deprivation in some areas, it was not described as terrible or horrific but as "life mirroring the times of Dickens". This less than perfect England was described by other authors like Benjamin Disraeli and Mrs Gaskell but it is Dickens's view that has really resonated through the ages. Dickens's live readings were said to be filled with humour and performance, with Dickens himself taking on the accents and mannerisms of the characters he was portraying. And it is the way the characters speak that often brings a smile from the reader. "Quite a lot of the time, if you were simply to describe the plot situation of one of the set pieces that you find very funny, it's not very funny at all," says Prof John Mullan, of University College London. "But it is very funny. The extraordinary thing he does introduce to the novel is the comic potential of the way people talk." And some in the industry think that Dickens has done even more for the current crop of comedians. "We're put off by this notion we have of Charles Dickens as this great Victorian novelist because it implies that he's serious," says writer and comedian Armando Iannucci. "In fact, I think he's the finest comedian we've ever produced. Much comedy today is conditioned by the way Dickens wrote it in the 19th Century and comedy writers today owe a huge debt to him. "It's that sense of the rhythms, the colloquialisms and the way we speak. In reality, we don't finish our sentences and we all interrupt each other." While everyone from Gwyneth Paltrow to Miss Piggy has taken a role in a film adaptation of Dickens's work, many argue that he was as instrumental in creating the conventions of cinema as he was for inspiring the content itself. Russian film director and theorist Sergei Eisenstein said that important aspects of cinema were created by the influence of Dickens on pioneering film director DW Griffith. He argued that Dickens invented, among other things, the parallel montage - where two stories run alongside each other - and the close-up. "The idea that Dickens invented cinema is obviously nonsensical but he was a key and important influence in its development," says Prof Graeme Smith, who wrote Dickens and the Dream of Cinema. "Once film arrived, his work inspired an extraordinary amount of early cinema." The BFI says that there were around 100 versions of Dickens's work recreated in film in the silent era alone. And those adaptations continue to this day. This is in large part because of the visual way Dickens wrote, creating painstaking depictions of places. Prof Theodore Hovet, of Western Kentucky University, has argued that Dickens's influence stretches further than just adaptations in modern cinema, actually providing themes and techniques that are still used today. For example, he says, the film Dirty Pretty Things' depiction of London pays "homage to a model established by Dickens's compulsive wanderings of the city". The development of the characters in Dickens is often heralded as one of his greatest achievements. The Dictionary of British Literary Characters lists 989 named characters in his work, including everyone from Pickwick Papers' Arabella Allen right through to Our Mutual Friend's Eugene Wrayburn. While characters in many novels before had used symbolic names, what Dickens did differently was refine the practice to suggest character traits and their role. Some are obvious - Mr M'Choakumchild, the teacher in Hard Times, or ambitious lawyer CJ Stryver in The Tale of Two Cities - but others are less so. In Great Expectations, Magwitch has a number of different interpretations - from a magpie representing theft to Magi, a Biblical reference to the wise men. This technique has since been used by everyone from James Joyce and Thomas Pynchon to F Scott Fitzgerald and Martin Amis. A couple of the most famous characters have become so recognisable that they have entered the language as nouns - somebody mean-spirited or lacking generosity being described as a Scrooge, for example. But one phrase that does not come from a name is "What the dickens?" Rather than coming from the author, it is believed to be a slang term for the devil and though its actual origins are unknown, it first appeared prominently in Shakespeare's Merry Wives of Windsor, over 200 years before Dickens was born. Bleak House, taking place as it does in the Court of Chancery before legal reforms in 1870, is a thinly veiled attack on the judicial system of the time. The current view of lawyers - less than a quarter of people in the UK trust them - seems to be at least partly inspired by characters such as the novel's Mr Tulkinghorn. "No two books outside the bounds of technical law are more worth reading for law students than Pickwick Papers and Bleak House," Zechariah Chafee Jr once wrote in the Harvard Law Review. "Even a trained trial lawyer, however, is puzzled by some of the legal points brought up by Dickens, because they have fortunately passed forever out of the realm of living law." Legal historian Sir William Holdsworth noted the importance of Dickensian record in a lecture given in 1927. "The treatment by Dickens of various aspects of the law and the lawyers of his day is a very valuable addition to our authorities," he said. "Not only for that period, but also for earlier periods in our legal history." But how much do the issues that Dickens highlighted still remain today? "Central to it, actually, is something that remains a problem," says senior barrister Anthony Arlidge QC. "Very often, particularly with small civil claims, the cost of the legal proceedings is bound to exceed the damages that are obtained."